The Sinai Park site, due to its elevated strategic position, has a history dating back to Roman times and before. The hilltop site enjoyed commanding views over the Trent Valley in both directions making it an ideal outpost being mid-way on a day’s march from Derby to Lichfield. The Saxons also used the location as a stronghold and, in Medieval times, the fortified manor of the de Schobenhale family, dominated the area. 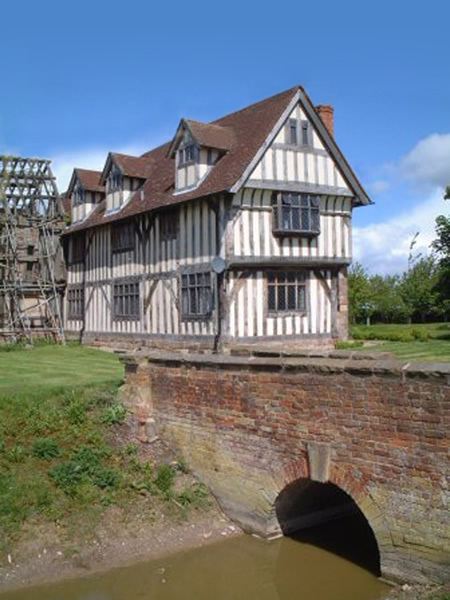 A large house preceded the existing one but the most evident feature from this period is the 14th Century moat, dated by one source to 1334, which pre-dates the house and has special importance. The de Schobenhales gave Sinai Park to the monks of Burton Abbey in 1004. At the time, this was one of the most significant monastic seats in England. In 1334, Abbot William Bromley of Burton Abbey gave five days indulgence from the bloodletting at Schobenhale Park with increased allowance of bread and beer for convalescence and recuperation. The origin of ‘Sinai’ is thought to be ‘saignée’, the French word for bloodletting and nothing to do with the Biblical ‘Mount Sinai’ due to its elevation. On a 1410 map, it is however, marked as ‘Seyne Park’. 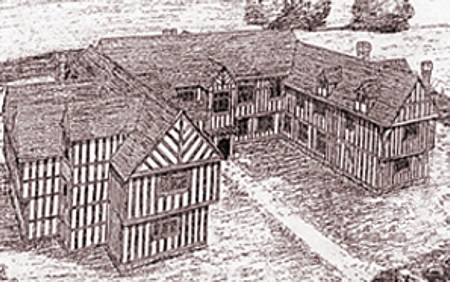 Around this time the monks were responsible for establishing two timber houses on the site which would later form the two wings of one large building when the two became joined together by a central section. There has long been a legend of a secret tunnel between Sanai and Burton Abbey but this is pretty clearly nonsense. Rest and recuperation seems to have gained quite a wide definition by the time of the Dissolution of the Monasteries in the 1530s. By then, the Abbot had his own parlour in the northeast wing, his monks were hunting for deer in the park and engaging in a number of highly frivalous activities, which even resulted in the occasional murder. These were cited in some of the reports back to Henry VIII to re-enforce the need for a dissolution. As a result of the Dissolution, Sinai was included in the many estates acquired by the William Paget family in 1546. William Paget, one of Henry VIII’s chief ministers, was also installed as the first Baron of Beaudesert. The Paget family would continue to own Sinai for almost 400 years during which time, they would also become earls of Uxbridge and marquises of Anglesey. Sinai was never the Pagets’ main house. This was originally their country house at Beaudesert and eventually their grand new home in Anglesey, Plas Newydd, designed in the 18th century by James Wyatt. Even within Burton, the Manor House (now offices close to the Winery) was their preferred residence so Sinai was used principally as a hunting lodge with its own deer park. It did though, enjoy a number of important guests including the earl of Essex during Elizabeth I’s reign. The main central section which joined the two existing wings together to form a much larger property, was built by the Pagets in 1605 which elevated the house to a much grander status. In the 1700s there was still more building work with large Tudor-style chimneys being erected which added further to its grandeur. Also from this period is what was then a very fashionable plunge pool (waterfall lake), built in the grounds, using as its source the Chalybeate well below the house. In 1732, a more impressive bridge over the moat was built to replace an existing one on the same site. The original bridge was one of four similar ones and the location of a skirmish between the Paget men and the Bagots of neighbouring Blithfield during the English Civil War. While the architect, James Wyatt, was being commissioned by the Pagets to build a new principal seat, Plas Newydd on the Isle of Anglesey, his brother William became the tenant of Sinai. William’s daughter was married there to John Smith who was working with James Brindley on the new canal network, and his son who took over the tenancy and stewardship of the house but was eventually fired and asked to leave for spending too much unauthorised money on its development. The last Paget to own Sinai was Henry Cyril Paget, 5th Marquess of Anglesey (1875 – 1905) who was known as ‘Toppy’. The ‘Black Sheep’ of the Paget family; a British Peer notable during his short lifetime for squandering away the Paget inheritance on a lavish social life and amateur theatricals accumulating massive debts. On the death of his father in 1898, as well as Sinai Park, he inherited the title and family estates which included Beaudesert in Staffordshire, formely the family’s principal residence, Plas Newydd on the Isle of Anglesey and other estates in Derbyshire and Dorset totalling over 30,000 acres and providing an annual income of £110,000. Someone would have to work very hard to make this fail! He spend very little time at Sinai which, on his death, was one of many parts of the estate that had to be sold as part of the settlement of family debt. After being sold, the house was converted to six ‘cottages’. 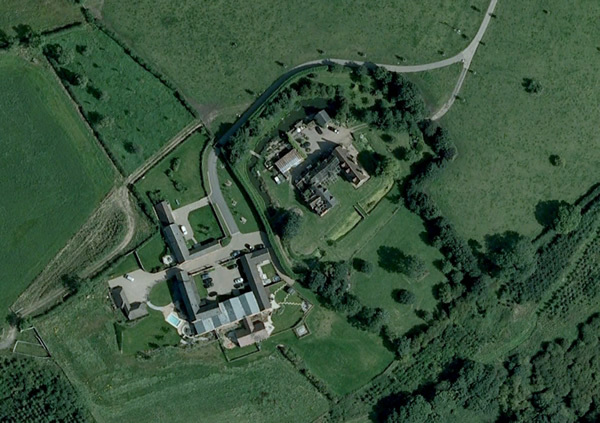 For a while, it provided a billet accommodation for the RAF. In a gravely deteriorated state, it eventually slumped to becoming a makeshift shelter for pigs, sheep and hens. 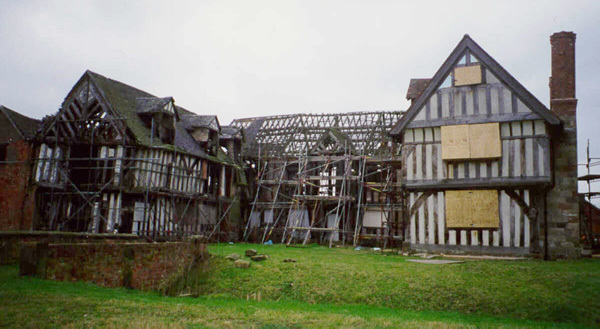 It was described as “The most important house in England to be in such a state”. In recent years, thankfully, it has undergone major restoration with help from the English Hertitage and is listed as a Grade II* listed building. The 13th century moat is separately listed as an ancient monument. Adjacent to Sinai Park House is the present day farm house and associated buildings.